Yesterday was the first day back to school for my awesome Grandchildren. Now, on to the Christmas card I created for this week! I love roses and I love Christmas so I decided to combine the two. To see how to shape the roses, watch the video at https://youtu.be/Z8P070kC﻿3oo. Card size is 6 x 6”. Cut white cardstock 12 x 6” and score at 6” on the long side. Fold to create a tent fold card base. Cut two 6 x 6” panels from the paper collection, ink the edges with Brilliance Orchid ink and adhere one to the front of the card base and one to the inside using dries clear adhesive. 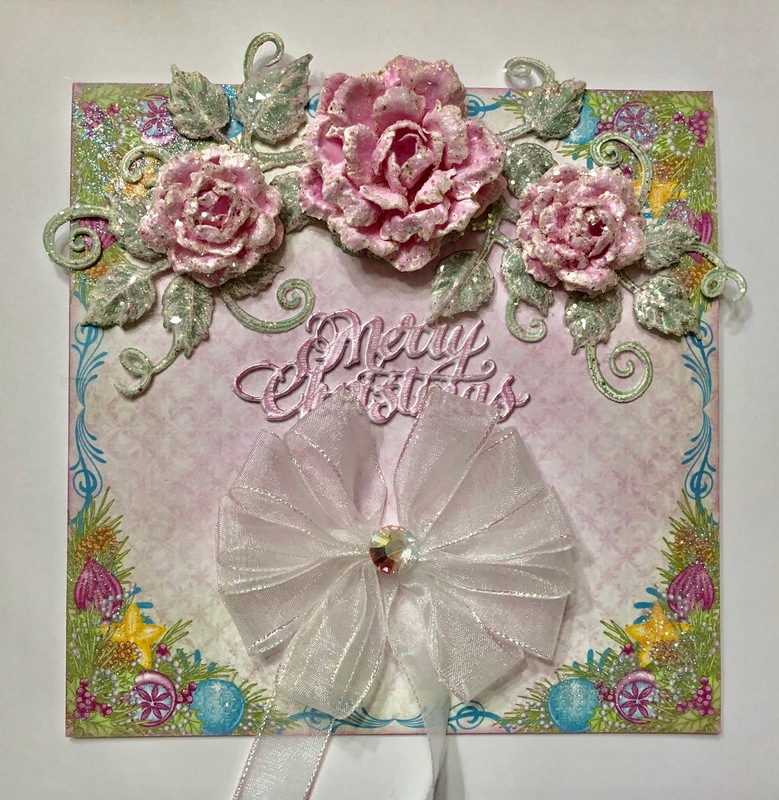 Stamp the roses on white floral cardstock using VersaMark, sprinkle with Aged Ivory Embossing Enamel and heat set using the Heat It Tool. Color the roses with Brilliance Orchid Ink using stack and store daubers and diecut using the coordinating dies. Place the petals face down in the 3D Rose Shaping Mold, spritz with water and run through the die cutting machine. Finish shaping with the Deluxe Flower Shaping kit, sponge with dries clear adhesive and sprinkle with Rajni Chawla’s Crystal Clear. Stamp the leaves on white floral cardstock using VersaMark, sprinkle with Aged Ivory Embossing Enamel and heat set using the Heat It Tool. Color with Ranger Archival Olive ink using stack and store daubers and diecut using the coordinating dies. Place the leaves face down in the Leafy Accents Shaping Mold, spritz with water and run through the die cutting machine. Finish shaping with the Deluxe Flower Shaping kit, sponge with dries clear adhesive and sprinkle with Rajni Chawla’s Crystal Clear. Adhere the roses and leaves to the card base as shown using a hot glue gun. 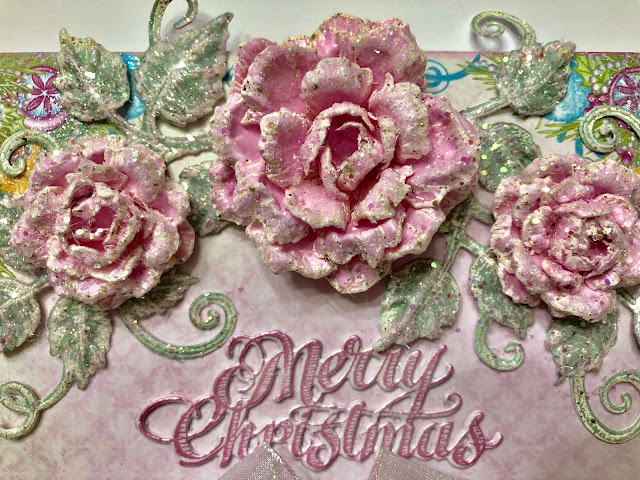 Stamp the Merry Christmas Sentiment on white cardstock using Brilliance Orchid ink and diecut using the coordinating die. Diecut two more times and adhere the layers together. Adhere the sentiment to the card base using dries clear adhesive. Make a multi loop bow using the Bow-it-All and adhere as shown using a hot glue. Adhere a large Swarovski crystal to the center of the bow with hot glue. Be sure to visit the Heartfelt Creations Blog to see amazing projects created by the design team! 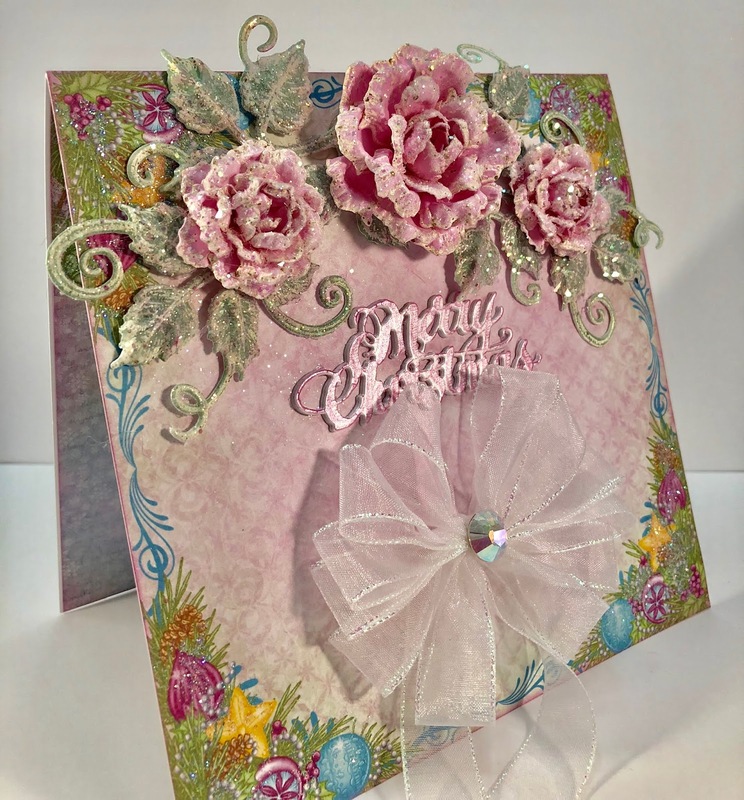 Gorgeous card - your roses are beautiful!! Thank you so much Patricia! Hope you’re feeling ok.
Beautiful roses sweet friend!! Love the gorgeous bow too! Thank you so much Robin! I love making roses!